CM Punk is without a doubt my personal favorite right now on the WWE roster. But I am a fair weather Punk fan, I can admit that. I really didn't care much for him when he first arrived in the WWE. I didn't really like his babyface persona back then. Although he did always put on a good show, I just didn't care much for the personality. It really wasn't until they turned him heel and he created the Straight Edge Society that I really took notice. It's an angle that was killed off way too soon in my view, but I digress. I'm writing today about my Christmas wish for CM Punk. It's pretty simple too, since he already has the WWE championship. My hope is that Punk will remain the champion and defend the title at Wrestlemania 28 in Miami. The last two Manias I've attended Punk has come out on the losing end (against Rey Mysterio and Randy Orton) I think with the storyline over the summer, the Money in the Bank, and the current situation in the WWE, CM Punk is a bona fide top tier guy now. I think that's awesome quite honestly. It's refreshing to have someone new breaking into that main event scene. CM Punk is talented in the ring and on the mic and isn't just a cookie cutter WWE superstar. He is a wrestler, yes I've had his Kool Aid and I like it very much, thank you. My other wishes for Punk this holiday season, I'd love to see Colt Cabana in the WWE again. But not until after January 14th. (Colt is wrestling at AAPW Main Event in Marion, Illinois that night) Originally I thought the WWE had plans to do some kind of reunion with these two and bring in Chris Hero and Claudio Castagnoli into the mix as well. Who knows, they still might at some point. 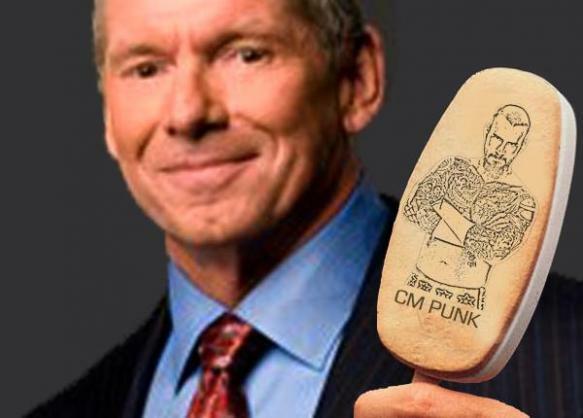 Even Mr. McMahon likes Punk! Regardless, Punk has really come into his own in 2011 and I would like to see continued success for him. And I'm also serious when I say I'd like to see a return of the WWE Ice Cream Bars. It's something Punk brought up over the summer and I believe it's something fans would love as well. So powers that be, let's make it happen. They could sell them at events and even in the grocery stores again. I know I'd buy them. That last part was legit, but I don't want it to detract from the original message. Punk is (pardon me JBL) a wrestling god in my view and I hope for nothing but the best for him in the new year. What are you thoughts? Post them here or like us on Facebook, follow us on Twitter, and subscribe to My 1-2-3 on YouTube.